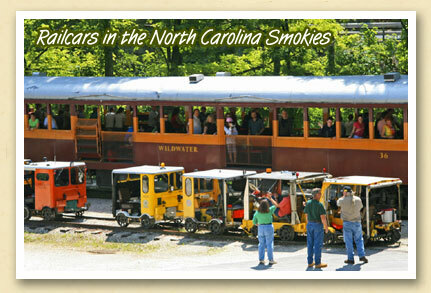 The tracks of the Great Smoky Mountains Railroad are a favorite of NARCOA – The National Association of Railcar Owners. It’s always fun to see a caravan of their tiny railcars making their way through the Smoky Mountains near Bryson City, as they did in early June. The railcars above were parked on a sidetrack at the Nantahala Outdoor Center allowing the GSMR’s scenic excursion train to pass through. Dennis Lockwood of the Greenville (SC) Chapter of the National Railway Historical Society was on the June excursion and told us a little about the railcars. “Our cars are all retired railroad maintenance of way vehicles. They are inspected for safety before each excursion and operators are tested regularly for railroad operational knowledge. All operators must carry liability insurance offered through NARCOA. “The motorcars require modification to reach NARCOA safety standards. So a freshly retired railroad motorcar must be upgraded before it can be operated on an excursion. Most owners also do some restoration and paint work, as the cars are usually worn when the railroads retire them,” Dennis added. The next Smoky Mountains Railroad excursion is NARCOA’s “Sunshine or Icicles” run scheduled for December 31, 2009 – January 01, 2010.